Have you ever been perplexed about the long delay of the Second Coming of Christ? Can God's Remnant People really hasten the approach of the day of the LORD? 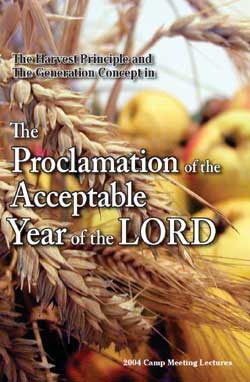 Read about the harvest principle as it relates to the work of the Gospel in the earth; study the mysteries of the cycles of history relating to human behaviour and the Generation concept which expands upon the fixed principle of sowing and reaping. Most important of all, learn how you can be harvest ripe; in other words, how you can reach maturity of Christian character and have the full reproduction of the fruit of the Spirit in your behaviour. You will then be prepared for the time of trouble which will come upon the entire world, and the Second Coming of our Lord and Saviour Jesus Christ. Remember the Apostle Peter said that we are not only to look for but can be very involved in the hastening of the coming of the LORD. May the rich blessing of the Lord be upon you as you read!